This is the Endsieg patch update, not a new build. I'm posting the downloadables here for new users or people looking to update older builds. This means the patch update is fixed? I think most users had to resort to the full install to make sure certain issues were not a problem. When the Russian version will be fixed the name of the town ? This issue has been reported as "Resolved" in the bugs database but that does not mean the fix is available yet. "Resolved" means they found the bug and have fixed it on their end. That is all. To get the fix to the public in a download or compiled in a patch with other fixes probably takes a good deal of time and effort. We must wait for any official notice for more information. Do we know what became of the the mirror link shown above? It worked for my desk top an hour ago, now it says file has been moved?????? It worked perfectly for my desktop. The links are working now. Yes, the updater was fixed. this issue will be addressed in the forthcoming patch. Thanks for your patience here, we're trying to get through as many issues, bugs and feedback as possible for this next update. Well then, you may want to inquire of the forum administrator, because that is exactly how I found those links, inoperative. Else, how was I able to take that screen shot of your post prior to editing it? There is a clue in that chanceywild said they had been working previously; I discounted that, thinking he was mistaken, but now I am inclined to believe him. Incidentally, you may want to also inquire as to the ongoing problem of posting and editing multiple images in posts which was reported shortly after they upgraded the forums. Incidentally, you may want to also inquire as to the ongoing problem of posting and editing multiple images in posts which was reported shortly after they upgraded the forums. [...] this issue will be addressed in the forthcoming patch. Thanks for your patience here, we're trying to get through as many issues, bugs and feedback as possible for this next update. [...] approach the peak of the holiday season, we wanted to let you know that the Slitherine offices will be shut from 20th December to 2nd January inclusive. The patch will be entering a closed beta next week, as it covers a lot of fixes, and we want to ensure they're correctly addressed and then nothing new has been introduced. I will formally announce the closed beta by the end of this week. OK, thanks for the heads up, Adam. Hi guys I've been sidetracked with other games for some months, but now want to reinstall the free OOB base game and all the DLC which I've already bought. So today I began by installing the free base game (it's v 6.1.7) and clicked "Check for updates" at the splash screen and got the message- "New update 7.1.4 available", but when I clicked to download it I got the message "Error, cannot install". So I'm at a dead end wondering what to do now (sniffle), any advice? Download and install the full 7.1.4 install from the members area, not the patch. There was some issue with the patch. Thanks, I installed free base game 7.1.4 and it works fine, but when I installed Panzerkrieg there was a Campaign but no Scenarios! 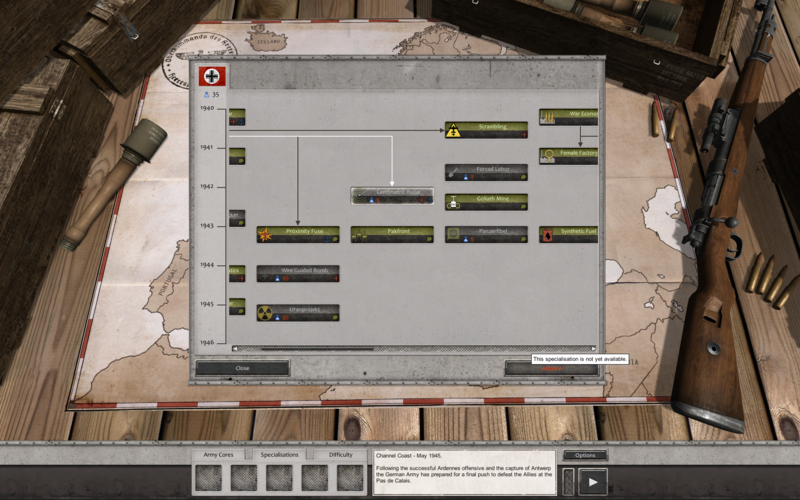 Where are my Panzerkrieg scenarios (sniffle)? I answered you in the other thread. Take care of that cold! I own ALL DLCs on STEAM and that bug is well know, but that lazy bunch of Devs haven't done anything ! If you bothered to check the forum you would have noticed that there is work on a large patch which is currently in beta.